Why Choose Our Pane Washing? Take advantage of a safe service in Ladbroke Grove that has gained over 95% of positive customer feedback! Q: How is your window cleaning Ladbroke Grove going to renew the clarity of my windows? Internal window treatment – The adepts will wash grime with ladders and sponges. Q: Can you polish my casements during harsh weather? A: If you spot rainy clouds on the day of your booking, don't panic. The window cleaners in Ladbroke Grove can still do the service as long as they're facing a light drizzle. However, in the event of a rainstorm, we will kindly ask you to postpone your appointment to avoid any injuries. Q: Can I help the specialists in any way? A: Yes, you can! The washing team will need a free parking slot in close proximity to your building (30 metres or less) and on the same side of your casements. A: It's no problem for the cleaners to rinse the outside surfaces of your glass façade as long as they are free to enter through your front gates. And if smudges have landed on your interior surfaces as well, just inform us and we'll conduct a free key pick-up and delivery. A: We will promptly inform you about the reason of the specialist's delay and notify you once he arrives near your premises. A: Yes we're certified to clean any type of casement or window accessory. Moreover, every PVC or UPVC frame or ledge will be cleaned at no extra cost! A: Yes, we can, but we'll only wash the external surfaces with the water-fed pole. With window cleaning in Ladbroke Grove, you'll give your windows the professional wash they deserve... at custom price rates that will stay within your budget! Don't believe us? Scatter your doubts by consulting our price table below. With window cleaning in Ladbroke Grove, we can better the appeal of your premises even if it scrapes the clouds above. Let's review what you'll get once you book our custom-tailored service. 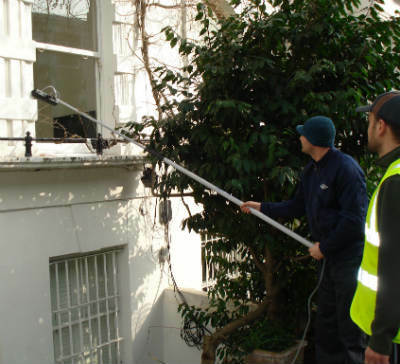 For external window cleaning, the Ladbroke Grove window cleaners will utilise a extendible water-fed rod. A water pump inside the specialists' van will deliver filtrated water up the hose and out of a brush-head add-on. The water, together with the brush-head, will remove any traces of filth from the casements of any four-storey premises. With rope access window washing, the pros will use safe climbing tools to reach even the highest storeys in your industrial or home property. We have all needed COSHH documentation and risk evaluation reports and can send them to you in a moment's notice. Moreover, we regularly check the washing gear to ensure that your booking will go without any complications. And to dight every inner corner of your window façade, the experienced team will use the regular sponge and ladder cleaning approach. In our mission to cater to as many Londoners as we can, we've widened our window cleaning in Ladbroke Grove to cover extra areas across the capital. For your comfort, we've included the names of these close by locations below. For those of you who'd rather book window cleaning services Ladbroke Grove W10 online, fill in our get a free instant quote form.